Months After Plane Crash Killed Most Of Team, Chapecoense Wins Championship : The Two-Way The Brazilian soccer club lost 19 of its players in a November crash that killed 71 passengers. But they officially took home the state league title Sunday after finishing with a superior record. Luiz Otávio of Brazil's Chapecoense (left) celebrates with teammate Wellington Paulista after scoring against Colombia's Atlético Nacional in April. Chapecoense has a chance at another title — that of the Recopa Sudamericana — when it plays Atlético again in the second leg of the final this week. Six months ago, a deadly airplane crash wiped out most of the Brazilian soccer club Chapecoense. Nearly its entire roster — 19 players, as well as the manager and most of the coaching staff — were killed when the plane ran out of fuel in the mountains of Medellín, Colombia. The team had been on its way to the finals of the Copa Sudamericana, a championship the club was awarded days later in a commemorative gesture. They never had the chance to win it on the field. 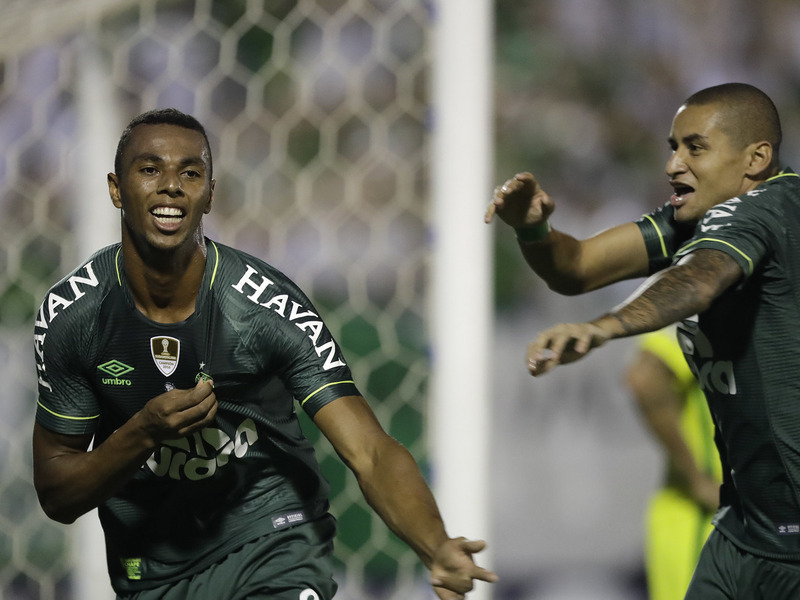 But on Sunday, Chapecoense earned a new title for far sweeter reasons: The club officially won the Santa Catarina state league championship despite a 1-0 loss, riding a superior record to a first-place overall finish. Chapecoense had already achieved a miracle of sorts last month by winning the second-half of the season, setting up a two-game final with the first-half winners, Avaí. Each team won one of the matches, making for a tie that was broken by comparing their final records — and that's where Chapecoense ultimately clinched the advantage. The club is no stranger to the trophy, having won the Santa Catarina title just last year and six times total, but many of the players themselves have never won it. After November's deadly crash killed nearly the entire team — and 71 of the 77 passengers on board — the BBC reports that Chapocense rebuilt its roster by signing 25 new players and promoting nine players from a youth team. The team dedicated Sunday's triumph to the tragedy's many victims. "We knew that [Chapecoense] would have a lot of difficulties because of the rebuilding of the team, but because of the work, we reached the title, beating opponents who are rivals and difficult to beat," coach Vagner Mancini, who joined the team just over a week after the deadly crash, said in a statement translated by the BBC. Now, Chapecoense has a chance at another title. As Copa Sudamericana champion, the club is playing the second leg of the Recopa Sudamericana later this week against the Copa Libertadores champion — who, by a bitter twist of fate, is the same team Chapecoense had been flying to play at the time of the plane crash: Colombia's Atlético Nacional. Chapecoense won the first match in that two-game series in early April, during the teams' first meeting since the tragedy.